 FOLDBALE FUN - Skidee scooters with foldable seats are fantastic fun for little ones! When the seat's down, toddlers can safely sit and play. And as they grow, the seat easily folds up and out of the way so older kids can scoot. And since the seat folds away, it's also hassle-free for mom and dad! 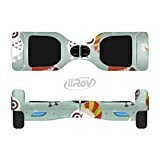  SAFE & SECURE - Keep your kid safe and full of smiles with kids scooters that combine strong and sturdy design with lightweight aluminum alloy for years of scooting fun! Plus, Skidee kick scooters have 3 wheels and back wheel breaking to help ensure total control.  BETTER BALANCE FOR A BRIGHTER FUTURE - Teach your kids to balance at an early age! With lean-to-turn steering, this toddler scooter is the perfect way for kids to learn balance and motor skills. This unique mechanism also protects against dangerously sharp turns, so you can make sure your kids are having fun while staying safe.  PARENT-APPROVED PERKS - Get the scooter that's designed for ultimate convenience. 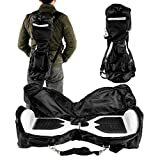 Fold the seat and handlebar to carry this lightweight scooter with ease. And the wide footboard helps your kids ride confidently when they're sitting or standing!  FOREVER & ALWAYS - Keep your kids scootin' forever, since your Skidee kids scooter with seat comes with a LIFETIME WARRANTY! Give your kids a childhood full of outdoor fun with the scooter that'll last and grow right alongside them! Sit or Stand for a Scootin' Good Time! No matter how your kid wants to ride, Skidee makes sure they'll have a blast! 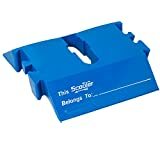 Skidee scooters have foldable seats, so your little one can scoot when they want, or sit if they're still learning. Simply press the button and adjust the seat to easily fold it up or pull it down for a relaxed ride. Kids grow quickly, so why not choose a scooter that'll grow with them? 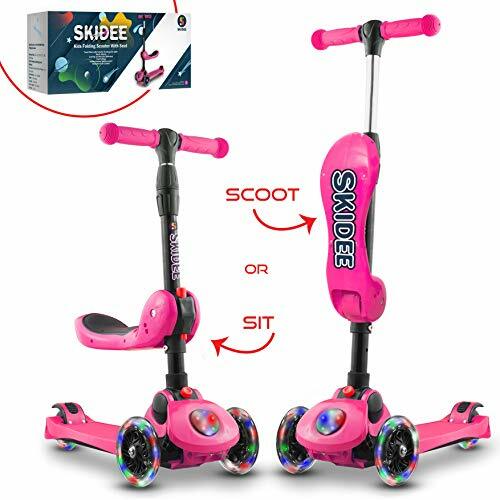 Whether you have an only child at home or a house full of kiddos, Skidee scooters are perfect for kids AGE RANGE 2-14. Easily adjust the handlebar from different height ranges to make sharing between siblings a piece of cake. Full of Fantastically Fun and Super Safe Features! Durable aluminum alloy stands up to kids that are less than cautious. It's also an incredibly light 7lbs, so carrying it is a breeze. Wide standing board gives plenty of room for both feet whether kids are siting or standing. Lean-to-turn steering hones balance and motor skills. Three wheels keep kids upright. Back breaks add an extra level of safety. Folding handlebar makes these outside toys as portable and hassle-free as they can be! At Skidee, we don't want anything getting in the way of your kids' fun. That's why your scooter for toddlers comes backed with our general 1 year warranty, and also with an option of a 5 year warranty. 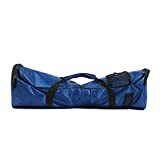 Purchase with confidence knowing you'll have summer activities and outdoor kids activities for many seasons to come. Whether your kids are sharing with siblings or growing and rolling, our scooters are ready to rock and roll with them! Add one to your cart TODAY!